My brother gave me a ton of frozen deer meat from last year’s hunting season. My husband found a recipe for venison stew in an issue of Outdoor Life. I modified it and used it for a venison roast. Though Matt ate it like a traditional roast with potatoes and carrots, I ate it like a stew because the broth was so tasty. The magazine recipe included portabello mushrooms, mustard greens, turnips, rutabaga, parsnips, tomatoes, and celery but Matt doesn’t like any of those things so I did not include them. I bet those mushrooms would have been really good. I cooked this for about seven hours, changing the setting from high (three hours) to low (three hours) to high (one hour). However, I think you could cook the meat on low for up to eight hours and then add the other ingredients in for up to three hours on high. Check your potatoes and carrots to determine cooking time. I wanted to make sure that the potatoes and carrots weren’t crunchy but also not mushy. The broth is very spicy and a little rosemary goes a long way. 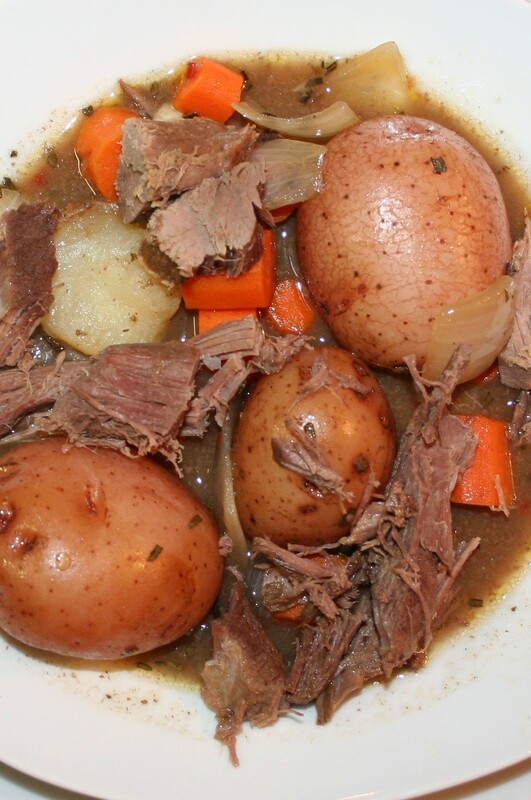 If roast is frozen, remove from freezer, rinse, and place in crockpot. Pour in beef and chicken broth. Heat a skillet or pot to medium heat, add olive oil and butter. When butter melts, stir in 1 cup red wine and slowly add 2 cups of flour. Stir until flour is blended and a paste forms. Add paste to the crockpot. Cook on high for three hours. Stir occasionally. Add all other ingredients. Cover and cook on low for three hours. Stir occasionally. Change setting to high for an hour. 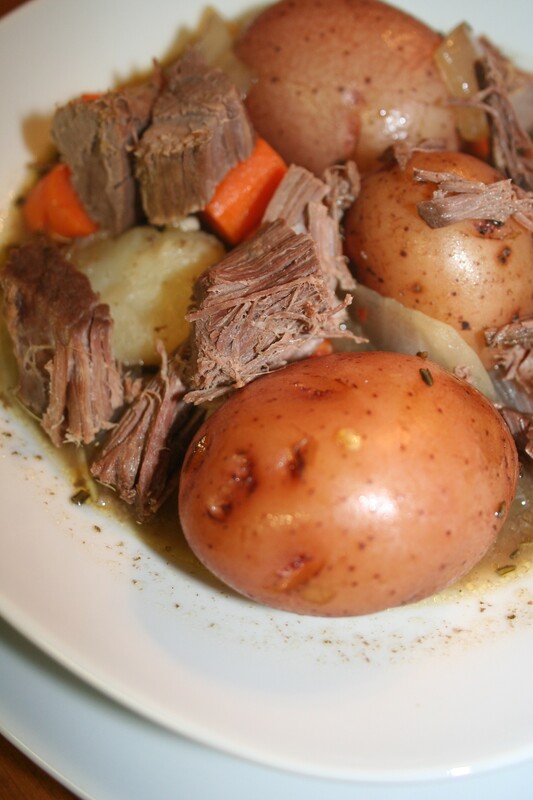 Serve with broth in a bowl or drain broth from meat and vegetables and serve as a traditional roast. Cook on low for up to eight hours. Add all other ingredients. Cover and cook on high for up to three hours. Serve with broth in a bowl or drain broth from meat and vegetables. Please is chili sauce or chili paste I cannot find it at the store what kind of cooking wine did you use could you please show pictures send it to my E-mail. Italystulip@gmail.com or even better my cellphone number 580-649-2540 thxs! Only used 1c flour and no chili paste. I would add mushrooms next time.